» We Already Liked You, Milwaukee Brewers! We Already Liked You, Milwaukee Brewers! 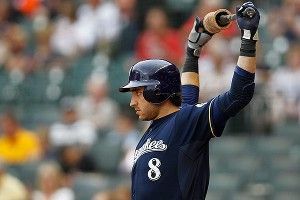 For what it’s worth, Jonah Keri thought the Milwaukee Brewers would be just fine this season, even without Ryan Braun. Even if Braun’s suspension is upheld, Corey Hart is an underrated hitter with 20-plus homers in four of the past five seasons; Rickie Weeks is one of the best offensive second basemen in the game; new addition Aramis Ramirez should provide ample sock; even new first baseman Mat Gamel could surprise in his first go-round as an everyday player. we STILL don’t know if that’s happening?!?!?) is a pitching staff that could be one of the best in the game. Few teams can match the Brewers’ top two of Yovani Gallardo and Zack Greinke, and there’s depth behind them, too. The bullpen’s well armed with John Axford and Francisco Rodriguez holding down late-inning duties. Milwaukee’s run prevention figures to get a big lift from a defensive change too, with sure-handed Alex Gonzalez replacing the execrable Yuniesky Betancourt at short. In the 30th anniversary of Harvey’s Wallbangers, pitching and defense just might nudge the Brewers back to the postseason. and still roll into October”). Look for more previews in the coming days. Oh, and a quick note on the Bill James projections we’ve been using: Yes, they are just about the most optimistic in the industry, and lag a bit behind some other projection systems in terms of historical accuracy. But these projections, conveniently displayed on player cards at FanGraphs.com, have the added bonus of including Weighted On-Base Average (wOBA) for each player. That’s a nifty new metric, a great catchall stat that runs along the same scale as on-base percentage, while combining a hitter’s on-base ability with his power. ZiPS, a rival system developed by ESPN baseball writer Dan Szymborski, tends to project more realistic levels of player performance. But it didn’t come out with accompanying wOBA forecasts (or a comparable stat like True Average) until this week, when Grantland’s preview series was already well under way. Baseball Prospectus’ PECOTA system has nearly a decade of credibility behind it, and also tends to produce more balanced projections. But PECOTAs are proprietary, and giving out projections for every team would go beyond the limits of fair use. So, for the sake of consistency, we’ll continue to use the Bill James projections. If one particular forecast seems especially out there, we’ll note it in that day’s preview, and maybe include a ZiPS projection for balance. Otherwise, know that every team’s projections are coming from the same source. And hey, it’s already shaping up to be a wild season, and we’re still weeks away from Opening Day. If there was ever a time for high levels of enthusiasm, this is it. Do Regular-Season Titles Predict March Madness Success?